I’ve finally found a skin care system that works for me, I’ve talked about it a few times on the blog already, but I’ve fallen head over heels for Paula’s Choice. I’ve actually already repurchased it, which is saying a lot, and I don’t think I’ll be switching anytime soon? I have, however, introduced a few more products into my current lineup to help tackle hyperpigmentation and discolouration. 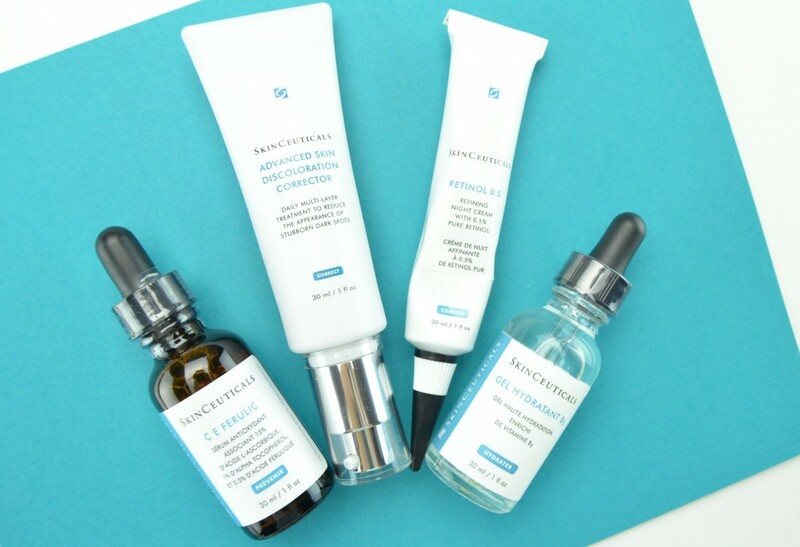 I’ve been experimenting with 4 SkinCeuticals products that are helping to prevent and correct my uneven skin tone. These 4 products, along with my monthly chemical peels from Mooi Spa have done wonders on my skin. 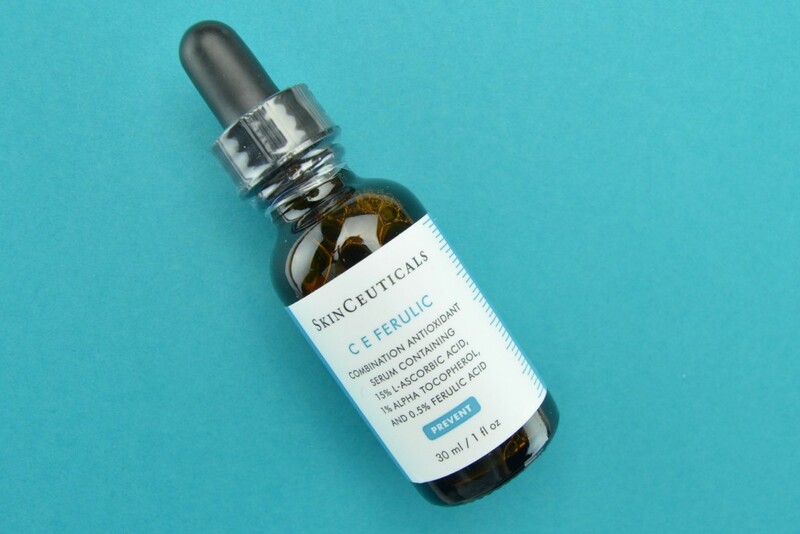 SkinCeuticals C E Ferulic is the perfect daytime serum as it delivers advanced environmental protection, while neutralizing free radicals that reduce the appearance of fine lines and wrinkles. It combines 15% L-ascorbic acid, 1% alpha tocopherol, and 0.5% ferulic acid that provides advanced protection against photoaging, while protecting against UVA and UVB. It also helps to boost collagen synthesis to help improve the signs of aging, providing unmatched antioxidant protection and increases firmness and replenishes lipids to reduce wrinkles. Once absorbed into the skin, it can’t be rubbed off and remains effective for up to 72 hours. 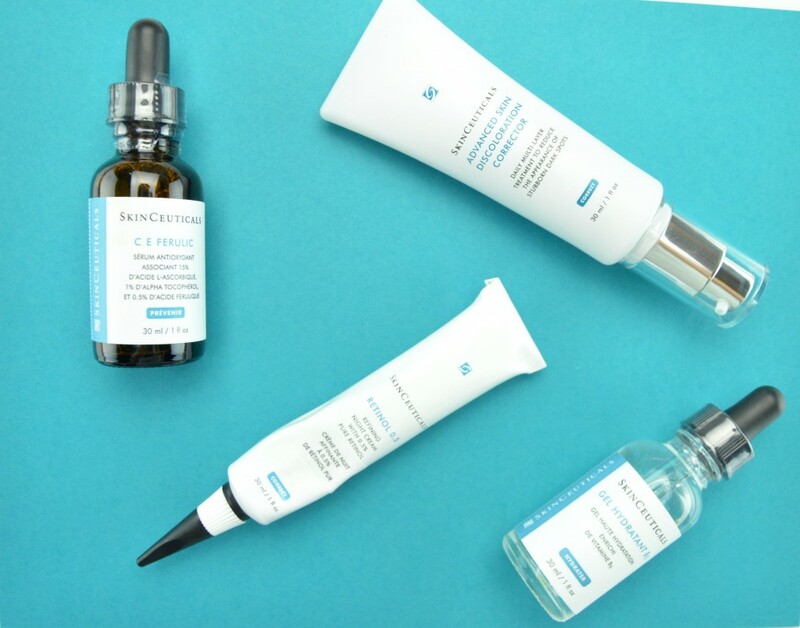 SkinCeuticals C E Ferulic comes in a luxe glass bottle with eyedropper for easy application. It’s has an incredibly lightweight, silky, serum texture that’s applied in the AM after cleaning my skin. I simply apply a few drops to both my face and neck after towel drying. It leaves absolutely no greasy or oily residue and is absorbed almost instantly. I’m obsessed that it can’t be washed or rubbed off, so I can apply my favourite foundation immediately afterwards. The only downside is the smell. It’s awful, I almost didn’t even want to use it, but after a short week, I was completely used to it. I sometimes even add a few drops to my sunscreen for added protection and to help mask the smell. The combination of high potency vitamins C & E is why I continue to use it, the long day effects of fighting free radicals that advance the speed of aging has me sold. The Ferulic acid serves as an anti-inflammatory which reduces cellular agitation, allowing my healthy cells to repair other damaged cells. It retails for $165 for 30ml. 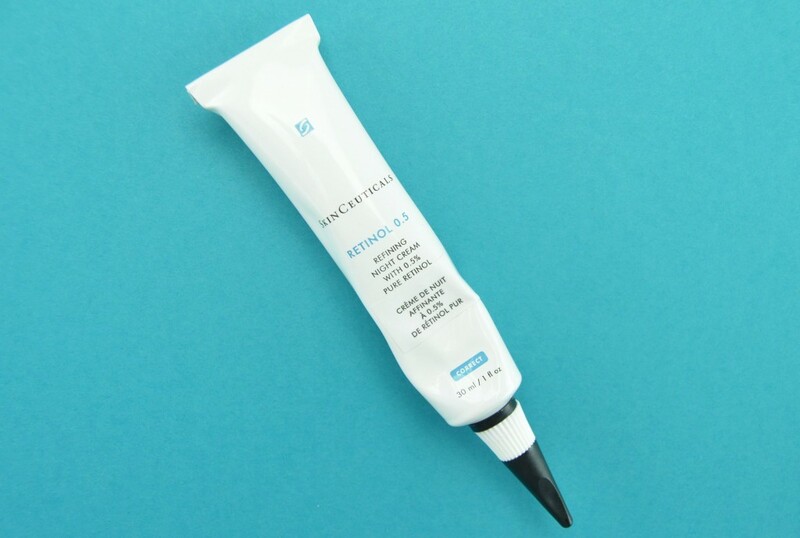 SkinCeuticals Retinol 0.5 is a highly concentrated refining night treatment that’s formulated with stabilization and delivery technologies to help provide maximum efficacy. It helps to not only diminish the appearance of age spots, uneven tone, fine lines, and wrinkles, it also helps to minimize the appearance of pore size, while reducing blemishes associated with problematic skin. I’ve tried retinol in the past and it’s always been too harsh for my extremely dry skin. Surprisingly SkinCeuticals Retinol 0.5 has actually been working for me. Thanks to its Bisabolol formula it helps to calm my skin and minimize irritation commonly associated with the use of retinol. It’s recommended to start using it once a week and then gradually increase your frequency to every other night. If your skin is able to handle that, you can eventually work your way up to every evening, if tolerated. You may experience a little irritation, stinging or redness as your skin adjusts to the new product, but this is completely normal. It also tends to dry your skin out and because of this, I don’t think I’ll ever be able to use it daily? A few times a week is all I need. It’s provided huge improvement on my skin already. I apply a pea-size amount, before applying my nightly moisturizer and wait a solid 30 minutes before applying any other product. This allows for optimal absorption time and for it to fully sink into the skin and do its thing. It instantly produces cell turnover by gently, yet effectively exfoliating the skin to give a more youthful appearance to the skin. It not only helps to minimize fine lines and wrinkles, it helps to address my hyperpigmentation issues. It retails for $74 for 30ml. 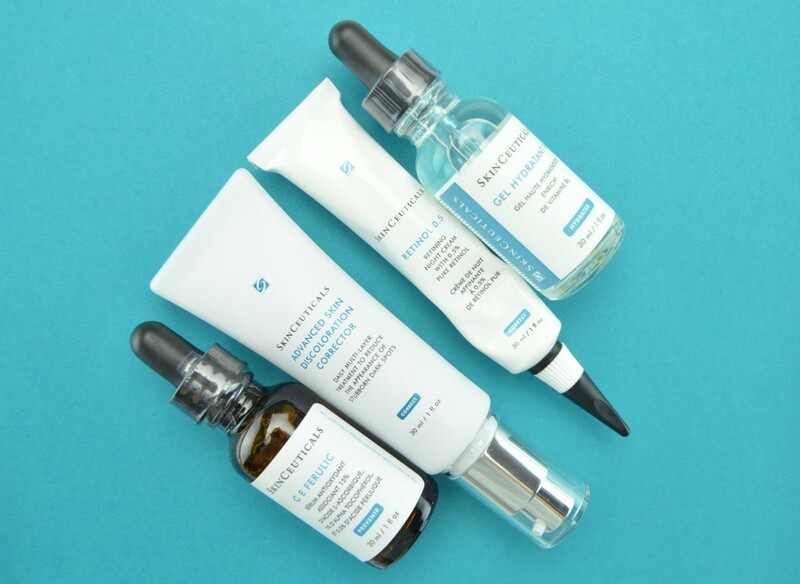 SkinCeuticals Advanced Skin Discoloration Corrector is a daily multi-action treatment to help to reduce the appearance of stubborn discoloration. It helps to improve the appearance of discoloration often caused by chronic UV exposure, hormonal fluctuation, and natural aging, while exfoliating the skin to improve its luminosity. This effective solution treats all layers of the skin to help correct existing discoloration, while preventing reoccurrence. 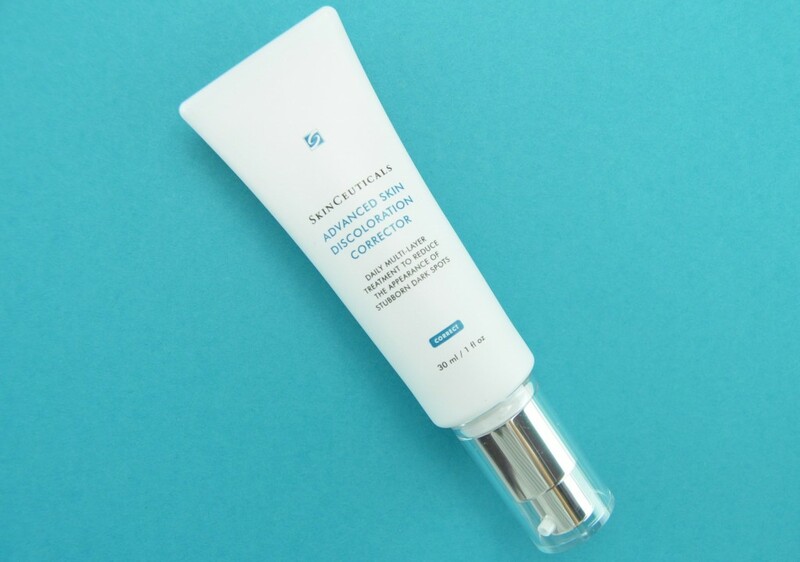 SkinCeuticals Advanced Skin Discoloration Corrector comes in a pump style bottle and has a lightweight, white creamy texture that instantly absorbs into the skin without a greasy or sticky residue. This is the perfect corrector to go hand in hand with my chemical peels. It helps to visibly lighten my sun spots and hyperpigmentation, along with evening out my skin tone. My skin is left brighter and more radiant after only a few short weeks. It also helps to reduce the appearance of imperfections and blotchiness. The overall luminosity of my skin tone and texture has improved significantly and I can’t wait to see what another few weeks of using this will achieve. It retails for $104 for 30ml. 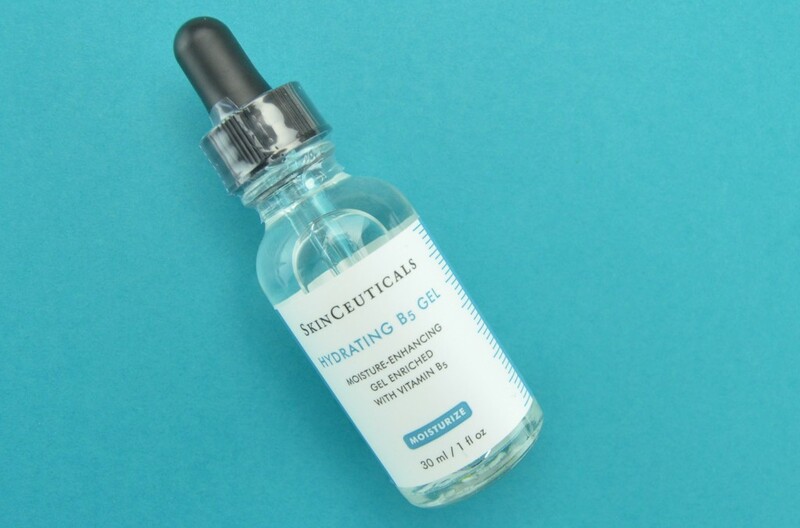 SkinCeuticals Hydrating B5 Gel is an extremely hydrating serum that helps to replenishes moisture and restores radiance for a smoother complexion. It’s enriched with vitamin B5 and Hydrating B5 Gel to replenish nutrients back into the skin for a smoother and younger appearance. It also contains high amounts of hyaluronic acid, the body’s natural hydrator, to bind moisture to the skin. 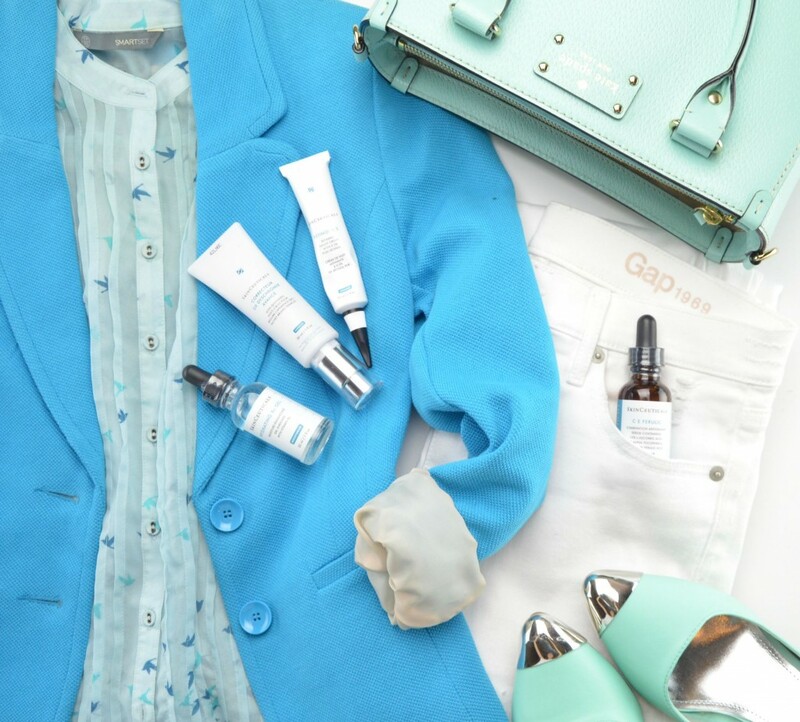 SkinCeuticals Hydrating B5 Gel is now my last step in my daily skin care routine. 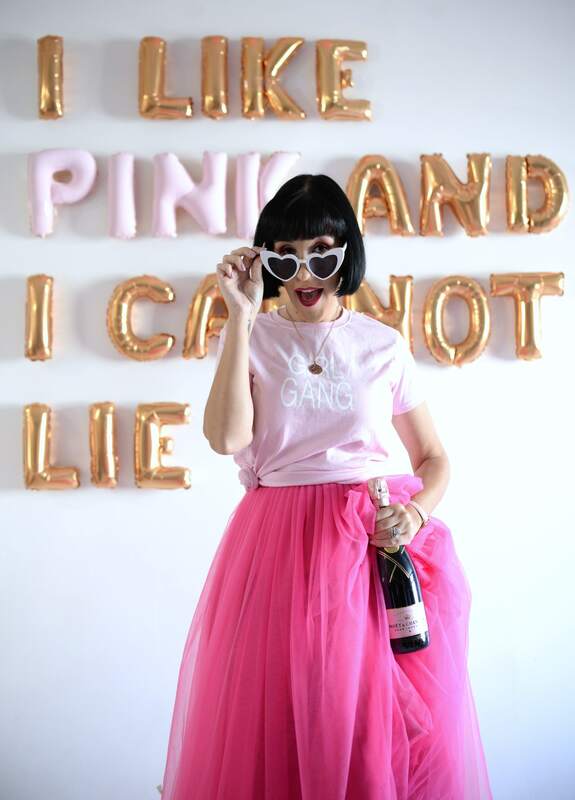 It too comes in a luxe glass bottle with eyedropper for easy application. I apply a small drop to my fingertip and work into the skin after I apply my daily moisturizer. Since it is so hydrating, some might even feel the need to skip their moisturizer? It has a slightly liquidy, yet thick, gel like texture that glides onto the skin with ease and absorbs within a few short minutes. It can tend to look a little shiny on the skin, so for the morning when I need to apply my foundation right away, I actually mix it in with my moisturizer to help combat the shine. It immediately plumps up the skin and helps diminish the appearance of fine lines, while keeping dry and patchy areas, plump and juicy. I’ve also been applying a small amount under my delicate eye area on the mornings when I didn’t get enough sleep the night before. It helps to depuff and instantly awaken the eye area for a brighter, wide awake look. It not only keeps my dehydrated skin moisturized the entire day, it gives the appearance of a healthier, glowing, more radiant and brighter look. It retails for $66 for 30ml.